The EU institutions reached a compromise today with member states on crucial waste laws to accelerate the transition to a circular economy in Europe. But all parts could have done much more to secure stronger recycling rates and prevent waste, says the EEB. After three years of discussions, the European Parliament and Commission reached an agreement with member states to boost recycling targets and waste prevention across Europe. The European Environmental Bureau (EEB) is Europe’s largest network of environmental organisations with around 140 member organisations in more than 30 countries. 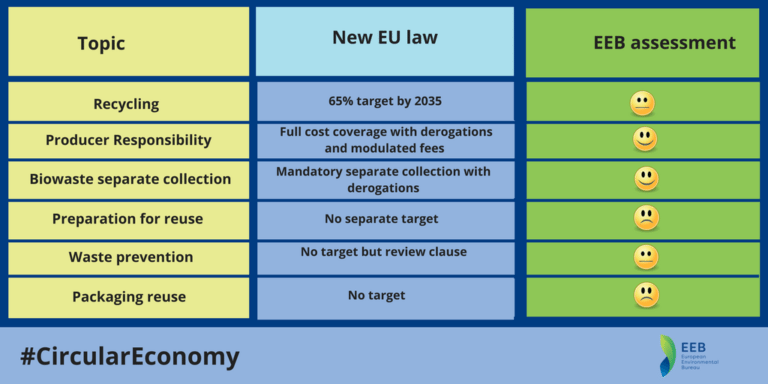 The EEB said that the new laws and targets will be crucial to help Europe transition towards a circular economy, but regrets that member states slashed almost all targets proposed by a more ambitious European Parliament. “This is not the outcome we all hoped for, but it is nonetheless a significant improvement compared with the laws that are currently in place. We are happy the discussions are now over. Now member states and EU institutions need to build on this decision to fully transition to a circular economy. Below is an overview of the most significant agreements. Member states will be required to recycle at least 55% of their municipal waste by 2025, 60% by 2030 and 65% by 2035, whereas the European Parliament proposed a 70% by 2030. With regards to marine litter, the new laws include provisions allowing countries to restrict the use of single-use plastics without facing legal action. Other positive notes include improvements in the traceability of hazardous substances in products and waste, decontamination of hazardous waste as well as restrictions on oxo-degradable plastics and planned obsolescence. The new laws will come into force in the beginning of 2018 and will need to be transposed into national legislation within 24 months from that moment.